A roomful of delegates waiting for the Secretary General who was very late. 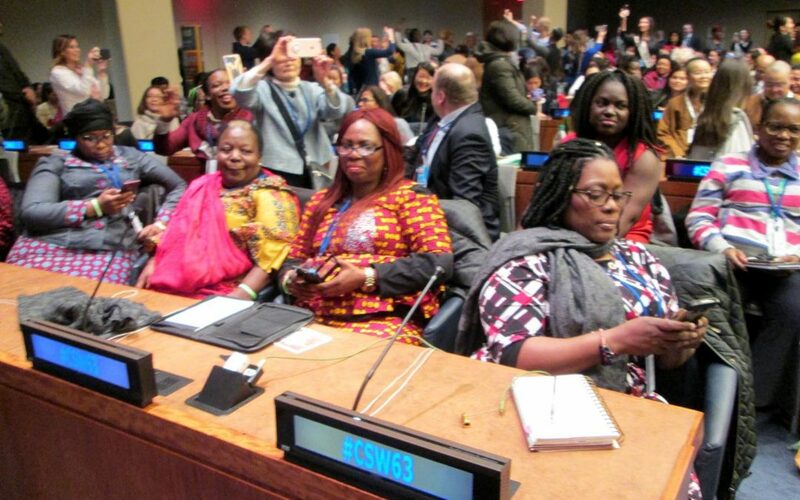 Lucina Kathmann, board member of Chicago Network, represents PEN International, an NGO with consultative status at the United Nations, at the 63rd meeting of the Commission on the Status of Women. Like all his predecessors, the Secretary General António Guterres is a man. I am chronically unhappy about this. The UN badly needs a woman Secretary General. However I am quite interested in his message. 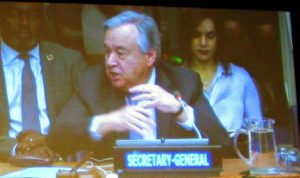 According to SG Guterres, in these times of pushback, we must push back against the pushback. He cited three internal UN matters and two external ones. The balance of power at the UN itself. Now the UN employees including those at very high positions are finally at gender parity. And zero tolerance for sexual harassment by UN employees in the field. Since this is going on in various places at a distance, it requires cooperation from the countries in which it happens. Quite a few countries have signed on to help. Violence against women. Despite a range of actions intended to help this problem it is not improved. Pushback against women human rights workers. There are new regressive laws, online campaigns against outstanding women…as we in Mexico know because of the violence and threats against journalists and online campaigns particularly to vilify women journalists. When the question and answer session began, almost immediately someone brought up the issue of visas for delegates. This produced an energetic round of applause. Everyone is unhappy because so many delegates and invited guests could not come to the CSW because they were denied a visa to enter the United States. Last year my report discussed the very bad situation with respect to visas for delegates. This year the situation is even worse; more visas than ever have been denied. 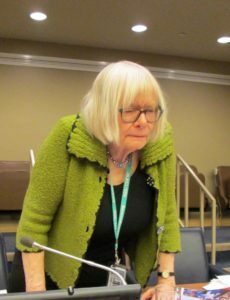 Frustrated women detailed their personal experience at every panel, everywhere they could get a microphone. They named the country and the women whose visas were denied. There were many countries and many women. These women had their paperwork, they had everything in order. In some cases the interviewer even congratulated a woman on her answers and even so, denied her the visa. Susan O’Malley, Chair of the NGO/NYC, the New York office for coordina ting NGO participation. The federal, state or local authorities of the United States shall not impose any impediments to transit to or from the headquarters district of : ( 1 ) representatives of Members or officials of the United Nations, or of specialized agencies as defined in Article 57, paragraph 2, of the Charter, or the families of such representatives or officials, (2) experts performing missions for the United Nations or for such specialized agencies, (3) representatives of the press, or of radio, film or other information agencies, who have been accredited by the United Nations (or by such a specialized agency) in its discretion after consultation with the United States, (4) representatives of non-governmental organizations recognized by the United Nations for the purpose of consultation under Article 71 of the Charter, or (5) other persons invited to the headquarters district by the United Nations or by such specialized agency on official business. The appropriate American authorities shall afford any necessary protection to such persons while in transit to or from the headquarters district. This section does not apply to general interruptions of transportation which are to be dealt with as provided in Section 17, and does not impair the effectiveness of generally applicable laws and regulations as to the operation of means of transportation. This treaty was a precondition for the UN being located in New York. In the past it has occasionally been violated, and the legal grounds that have been cited in the exception related to a perceived threat to US national security. Some of those cases have been pursued by the courts. Yet obviously in the past two years it has been violated many times, and the exception is not the reason for denying these visas. Nobody claims that a woman invited to discuss farming in Ethiopia is a threat to national security. When the delegates or guests or their organizations have inquired why the visas were denied, in some cases they receive no answer. However in some cases the immigration agents have cited these reasons 1) the women were not legally married 2) they did not have children 3) they did not own property and 4) they did not have evidence of stable work to which they must return. The agent suspected they might overstay their visa. 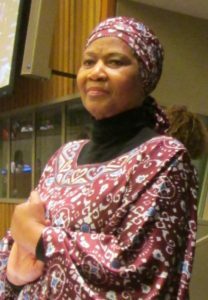 Nobody from the US government has brought up a case of a woman who testified at the CSW overstaying her visa. The NGO association that organizes events during the CSW, CSW/NGO, says it has not heard of a single such case. Opinions vary on what to do about this. These are suggestions I have heard. Move the CSW to Addis Ababa.